Henry has lived on the farm all his life and it’s been his main role over the years to keep our farm alive. He’s taken many brave steps since taking over from his father Rob Wilson. Henry’s planted a range of crops, reared a variety of animals and headed up various farmers co-operatives. Planting a field of vines at the young age of 65, was perhaps his most ambitious project to date, but it was a decision he has not regretted. Although he keeps telling us he’s ‘retired’ you’ll often find him in the vines or on the tractor. He takes on the role of security from time to time at our weddings and is always on call for help and advice when we need it. 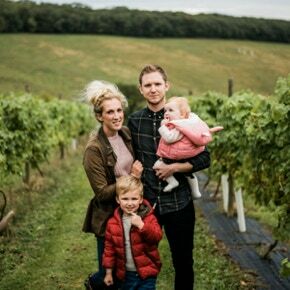 Henry enjoys hosting our vineyard tours and chatting to people at various markets and after diner speaking events across the county. Although Henry no longer lives at the farm house, he and his wife Heather don’t live far away and still have a view of the fields from their sitting room window. Tom is Henry’s son. He moved home to the farm in 2014 with his wife Nikki and two girls Ellie and India. After working on a range of large farms in Yorkshire and Lincolnshire, driving and maintaining some rather fancy machinery, he brought home with him a wealth of knowledge on farming and land management skills. On returning to the farm he brought some of our unproductive land back into work and has helped with the establishment of the new vines. The willow and turkeys are also Tom’s responsibility and since his return home we have had some brilliant feedback on the quality of the birds. Tom is chief marquee man and is the man with a plan when it comes to getting jobs done on the farm. You will find his girls serving drinks at the weddings and ensuring the place stays ship shape for all the guests. Apart from a short stint at university Alice has lived on and around the farm all her life. After finishing her degree in Childhood Studies and Professional Practice she went on to be a primary school teacher in and around the hull area for the first few years of her professional life. In 2014 she had her first son Harry and a year later Alice joined the farm full time heading up the weddings and events held at the farm along with developing the company branding, marketing and sales. In 2016 she was lucky enough to tie the knot with her husband Andy at the site and in 2017 welcomed their second child Georgie into the world. Alice hosts many of the wine tasting events held at LWV and you’ll often see her on the quad, fixing fences, as well as throwing the odd sledge hammer around. In 2018 she proudly won the ‘woman of achievement’ award in the Hull Woman in Business event. Her husband Andy is the techy one of the family and is in charge of our web design and online shop (along with his full time job as a telecoms manager). Little Wold Vineyard is part of Market Place Farm.